The Swedes’ answer to this year’s remake of The Evil Dead, and while it is better than the Evil Dead remake it has it’s own issues. Similar set up, young people go to a house in the woods and one girl encounters a creature from Swedish folklore in the basement. Soon after all hell brakes loose and the youngins find themselves battling..themselves. First off, great gore and effects. There are some truly memorable scenes in Wither, but I wish they had paid more attention to the plot because there are a few holes you could drive a truck through. That being said, the camera work is good and the acting is decent enough to make Wither a worthwhile cult film, especially if you like your horror with a good dose of bloody gore! 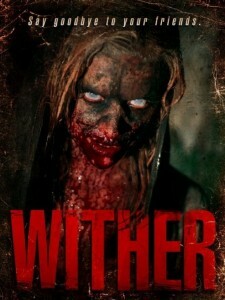 Right now Wither is available only HERE on VOD and DVD. New Tla Video customers get 20% off so you only pay 3 dollars for the 7 day rental! This entry was posted in cult films, horror dramas, indy dvds for sale, indy horror, Low Budget Horror Films and tagged bloody gore, cult film, evil dead remake, gore fest, gorey movie, Swedish Evil Dead, Wither, wither dvd, wither vod. Bookmark the permalink.